*** The reviewed, white, navy blue and burgundy Tank Tees are over 5 years old and the navy and burgundy colors are no longer listed on the ExOfficio website, but they are exactly the same in material and construction as far as I can determine. The ExOfficio Women's Give-N-Go Tank Tee (hereafter simply called the "Tank Tee" or "Tank") is a stretchy top fashioned from a waffle-weave cloth made from mostly nylon with a touch of Spandex. 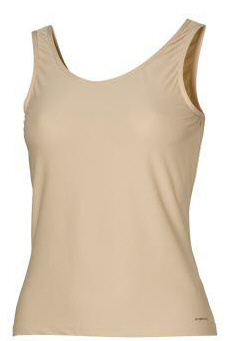 The more or less, form-fitting shape of the Tank Tee is that of a traditional women's tank top, that is to say, is sleeveless with a moderately scooped neck and back and narrow, but not "spaghetti", straps. The armholes are full-coverage and cover a bra completely. A thin elastic binding is double stitched and is used for the interfacing of the neckline (front and back) and the armholes. The only other seams are the two side seams and the two shoulder seams which are stitched over to prevent unraveling and are unobtrusive. All stitching is same-colored so there is no contrast. The only accent is a small 1.3 inch (3.2 cm) long black ExOfficio logo on the left side seam near the hem. 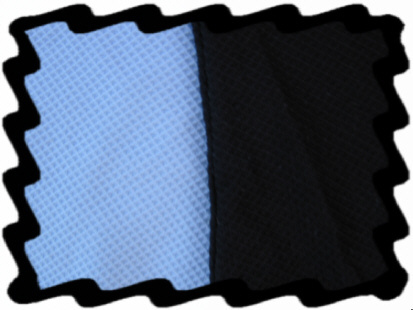 The Tank Tee is not lined and the waffle-weave of the fabric can be seen more faintly than the outside fabric, but is still visible. The material is incredibly soft both inside and out. For the size SMALL, the straps are the same and so is the side seam, but the front and side to side measurements are approximately 0.5 inches (1.3 cm) smaller. Over the years, the Tank Tees have been on my back in all sorts of terrains and climates. Florida, New Jersey, Michigan, California, Colorado, Nevada, Arizona, North and South Dakota are some of the states where I've worn the Tank Tees. Seashores, deserts, prairies, and mountains were some of the terrains. Temperatures ranged from below freezing to over 100 F (38 C) with humidity from single digits to 100%. 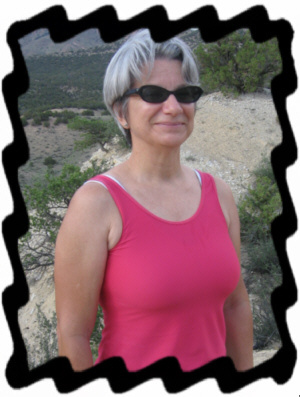 I have worn the ExOfficio Women's Give-N-Go Tank Tees for years now - at least five and most likely more. While the ExOfficio website lists them under "women's underwear", and I have worn them as such on a few occasions, mostly I have worn them as outerwear either solo or with other layers. In cold weather situations, I layer the Tank Tees with long sleeve shirts to keep my core warmer, but mostly to wick away the inevitable sweat I manage to produce even in the winter when snowshoeing or hiking strenuously. The Tank Tees are thin and form fitting enough to provide negligible bulk. The silky texture ensures outer layers slide easily over the top of the Tank Tees. And the Tanks are easy to don and doff, unlike sports bras which can often have me trapped in twisted material. Surprisingly, the very close fit of the Tanks is not so tight as to be immodest. Other than with the white color Tank, my bras do not show through and there are no horribly unsightly "bumps" from the stitching. When wearing a bra that clasps in the back, the fastenings are somewhat visible, but not objectionably so. Certainly not more noticeable than with most other tees I own. My wider sport bra straps are visible at the shoulders, however. Mostly, on the trail, that is the least of my worries though. The close fit of the Tank Tees also encourage me to turn down that extra Some-More as any excess weight around the middle becomes quickly apparent! Despite the fact that I own and wear both the small and medium sizes, I don't have any problems with too tight (or too loose) fit. The armholes are not at all binding and due to the stretchy nature of the Tanks' body, I don't feel any constraints anywhere else. The short length of the Tank Tees is a minor irritation for me; I wish it were a bit longer. At my age, I'm not all that keen on baring my midriff. Thankfully, the Tank Tees perform in a stellar manner when it comes to staying "tucked" into whatever bottoms I have on. I find the Tanks "stick" to my pants nicely and I stay covered. Hot trail conditions are where the Tank Tees really shine! First, the Tanks barely add any weight over one of my good sports bras, so that's good when it's so hot that anything heavier than a tissue causes me to break out in sweat! Actually, because of the excellent wicking capability of the Tank Tee, wearing one is better than not wearing anything at all, something that would most likely scare the wildlife anyway. Having the Tank's fabric against my skin absorbs the moisture and keeps my skin drier and less apt to get chafed from my backpack. And as when inevitably the Tank does become soaked under my pack, after removing the pack I find the Tank dries out before I'm even finished with my snack/break. I wish I could say the same for the rest of my clothing. I've never been one to spare my clothing from the rigors of backpacking, hiking and life in general. Encounters of the close kind with juniper bushes, grabby pine tree branches and prickly cactus are common for me. I'm also not the most careful person when it comes to leaning against a cool rock - although after a recent rattlesnake scare, I will most certainly be more careful in the future! Snags are a fate to which all my gear is resigned. The Tank Tees are no exception, but still they have worn well. Thankfully, backpack shoulder and chest straps have not caused undue wear on the Tanks. I have to say, after all this time, the Tank Tees still look great! Again, except for the white colored Tank, I don't think the oldest Tanks (5 years +) look any worse for the wear than the newest ones which are about 5 months old. There are no tears, either in the body of the Tanks or the seams. The hems are not droopy or misshapen. The seams are still straight and none of the stitches have become loosened or ripped. The colors are still vibrant with no fading or sweat-staining whatsoever. With each washing in cold water and no bleach, the Tanks shrink up a bit, but as soon as I pull them on, they reform. I do not use a dryer as ExOfficio care instructions say is permissible, nor do I iron them as permitted (iron - shudder! ), but I hang the Tanks to dry which they do in minutes. Lastly, I have rolled up and squashed my Tank Tees into very small balls and jammed them into the corners of my packs tightest pockets only to have them look like they were neatly hung in a matter of minutes after I've pulled them on. They are keepers, yes, they are! 2.) Wick away sweat like nothing else I own. 3.) Wear like iron with no special care given. 4.) Attractive with vibrant colors and neat look. The ExOffico Give-n-Go Tank Tees will continue to hold a permanent place in my technical clothing wardrobe. I also wear them constantly in the summer for casual wear. The Tank Tee's good looks allow me to be cool and neat both on the trail and in town. I wish the length of the Tank Tees were a bit longer and the the straps to be a bit wider. However, since the Tank Tees stay put when tucked into shorts or pants, I am not self-conscious about their fit when wearing them solo. Their extremely comfortable feel allows me to wear the Tank Tees literally day and night. I don't know of another tank or tee I own to be better at wicking sweat and drying as quickly as this tank. Despite rough treatment, my oldest Tank Tees appear almost as unscathed as my newer ones. I'm sure I'll be wearing them for years to come. Thanks ExOfficio for this quality product!